The specific place that researchers at the Space Mission Analysis Branch of NASA’s Systems Analysis and Concepts Directorate are looking at is roughly 31 miles above the surface. At this range, there is one atmosphere of pressure (at the surface it’s approximately 92 times that of Earth), and the gravity is similar to what we find on our home world. It’s a wee bit on the hot side, but manageably so at 17 degrees Celsius above the average Earth temperature. This close to the sun, it would even be a prime spot to use solar power to run things. A proposal is in the works that would eventually lead to an enduring settlement. Right now, the plan involves five phases. First comes robotic exploration, followed by a 30-day mission by a manned flight that would orbit the planet. Next, a crewed mission would spend 30 days in the atmosphere, followed by a stay of one year, and finally there would be a permanent human presence. 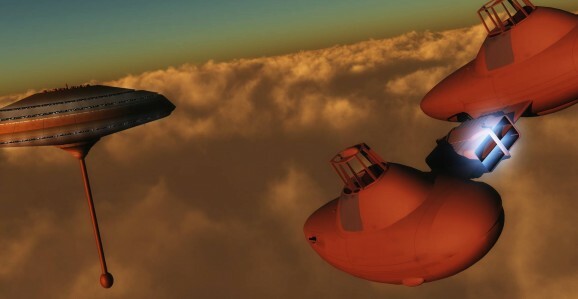 The airship would enter the Venusian atmosphere inside an aeroshell at 7,200 meters per second. Over the next seven minutes, the aeroshell would decelerate to 450 m/s, and it would deploy a parachute to slow itself down further. At this point, things get crazy. The aeroshell would drop away, and the airship would begin to unfurl and inflate itself, while still dropping through the atmosphere at 100 m/s. As the airship got larger, its lift and drag would both increase to the point where the parachute became redundant. The parachute would be jettisoned, the airship would fully inflate, and (if everything had gone as it’s supposed to), it would gently float to a stop at 50 km above Venus’s surface. That sounds difficult, very, very difficult. And that’s assuming they could ever get funding, which, considering all of the resources and planning NASA is putting into going to Mars, doesn’t seem likely any time soon, unless there’s a drastic shift in priorities. Still, it’s an incredible idea. Maybe they can start work on a Death Star next. It’s a small operation, but NASA just made a deal that would…. You know what? I’m not even going to finish.